Come Easter or Christmas, we are ready on your table in the mornings. Adults and kids look forward to me for a great start in the mornings with some veggie and coconut goodness. Does that sound familiar to you? The above stated is a typical Christian home serving istew/stew for breakfast. 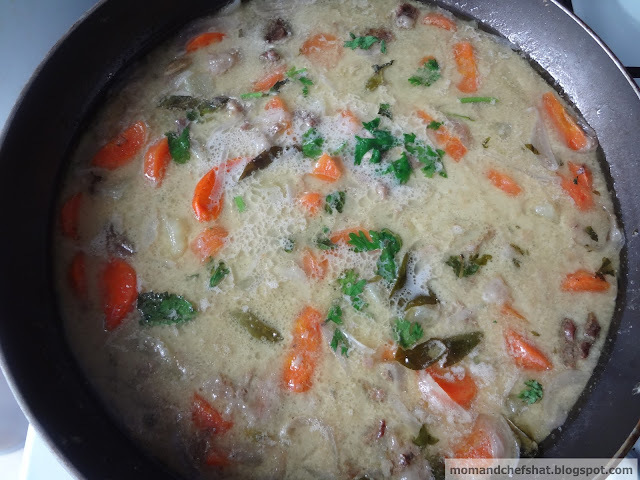 Christian festival gatherings are never complete without appams and beef/mutton stews, though a lighter version in the form of vegetable stew is gaining popularity nowadays. Cook beef in a pressure cooker with salt, green chillies, and ginger until well done. Keep aside. Slice carrots in round shapes. Cut potatoes in cubes. Heat oil in a pan, splutter cinnamon, cloves, peppercorns, and cardamom. Saute onion, green chillies, and curry leaves. When onion becomes transparent (don't fry the onions for too long), add water, potato and carrot. When carrot and potato is half boiled, add cooked beef along with stock. Now close the lid and cook potatoes and carrots in low flame. When potatoes and carrots are cooked, add 1/4 cup of coconut milk along with water. 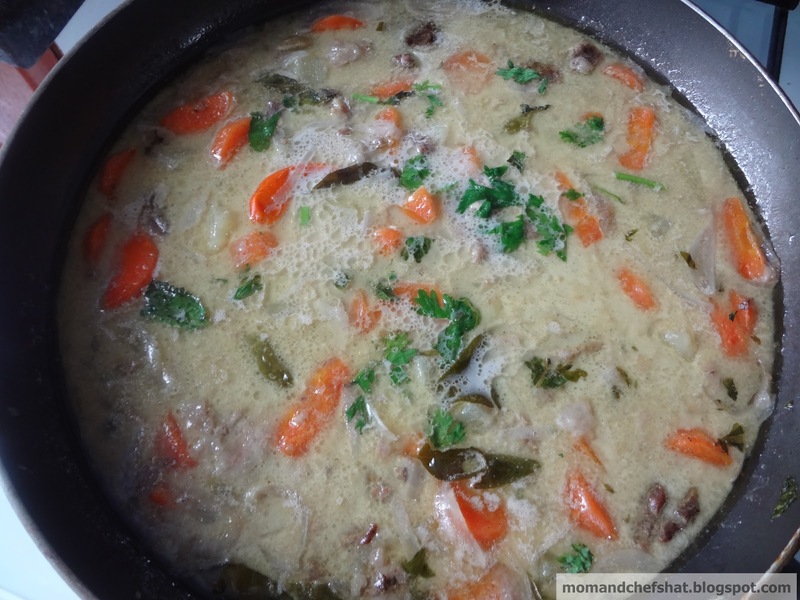 When it starts to boil and thicken, add remaining coconut milk (remaining 1/2 cup). When it is about to boil, take out beef stew from stove (don't boil). Garnish with coriander leaves and mint leaves. Enjoy next day with puttu/steam cakes!!! If marriage happens between two families, then I can very well say that I got married to a family of meat lovers. Me ..... being born and brought up in Cochin, it was definitely easy to gel with them. Anglo-Indian households have a distinctive character of its own. They are one big merry making lot who love to eat, eat and eat. Most of the dishes cooked in their kitchens resembled or were almost the same, which my Mom used to make. But definitely not this one, this certainly has got an Anglo touch to it. The recipe is from the Iron lady of the house, whom we lovingly call Mamma (my hubby’s granny). She has a unique character of her own, always seen hale and hearty, running around the house, and doing her chores. No wonder she brought up 12 children all alone. The dish we are talking about is Iron lady’s signature dish and familiar to the members of family as Mumma’s beef curry. Immediately our marriage, we spend some days with her. On one of the days, Mumma prepared this curry for us all by herself. How wonderful is that! and Wow much to my surprise, it was steak in curried form. Felt like eating out at a steakhouse with a Kerala twist to it. Was purely a treat for me and fell in love with it for the first time. Love you Mumma. The dish was very inviting showing the Anglo-indian side of them so evident. There is one more unique recipe which is famous in the family and that comes from Papa (hubby’s grandpa). It is really a tough competiton for Mamma’s beef curry. Papa’s beef curry is too simple yet it tastes scrumptious. Can I say simplicity at its best …..oh, yeah, it is. I will be posting it soon. 1. Wash and clean the beef and let it sit for sometime so that all the water goes off. Pound beef pieces one by one with a knife horizontally and vertically to get flattened beef steaks. 2. Slice the onions. Chop ginger and garlic. Using a pestle and mortar, pound the shallots, half of the ginger chopped, half of the garlic chopped. Now add pepper powder, fennel powder, garam masala, and turmeric powder to this and pound them again. 3. Keep the other half of ginger and garlic for later use. 4. Heat oil in a cooker, saute onion, reserved ginger and garlic. When it is sauteed well, remove it and keep it aside in a plate. 5. Now saute the already pound shallots, ginger, garlic, pepper powder, fennel powder, garam masala, and turmeric powder. When they are sauteed well, add the flattened beef pieces and reserved things from #4. 6. Mix well and pressure cook till two whistles. 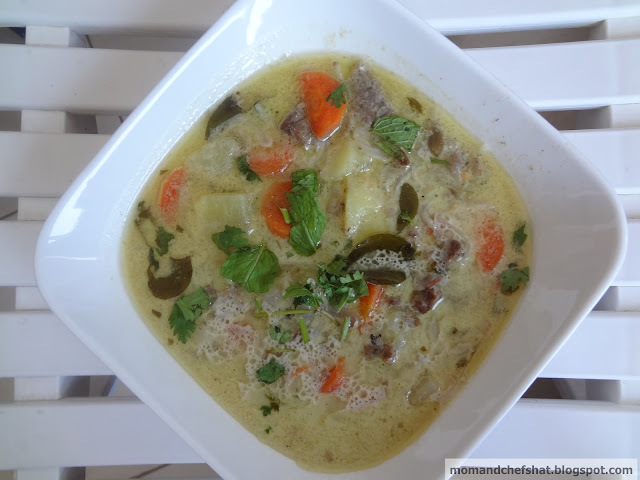 Mummas curried steak pairs equally with rice, chapathi, idiappam, or tapioca. When you strike beef horizontally and vertically, the steak will become like the one shown in the picture above.